In February 2019, a study was published in Diabetes Research and Clinical Practice titled “Does high-dose vitamin D supplementation impact insulin resistance and risk of development of diabetes in patients with pre-diabetes? A double-blind randomized clinical trial.” The objective of this study was to determine the effect of vitamin D on insulin sensitivity and the rate of progression to diabetes among adults with pre-diabetes and vitamin D levels less than 30 ng/ml. In this clinical trial, 162 participants were randomly assigned to either weekly doses of 50,000 IU of vitamin D for 3 months and then monthly doses of 50,000 IU for 3 months or placebo. Researchers measured HOMA-IR, a measure of insulin resistance, and glucose tolerance to assess progression or regression of diabetes. Among participants who completed the six month study (N=83), the average vitamin D level in the vitamin D group was 36 ng/ml compared to 16 ng/ml in the placebo group. The research team found that the vitamin D group had lower HOMA-IR scores compared to the placebo group (2.6 vs. 3.1, P=0.04). 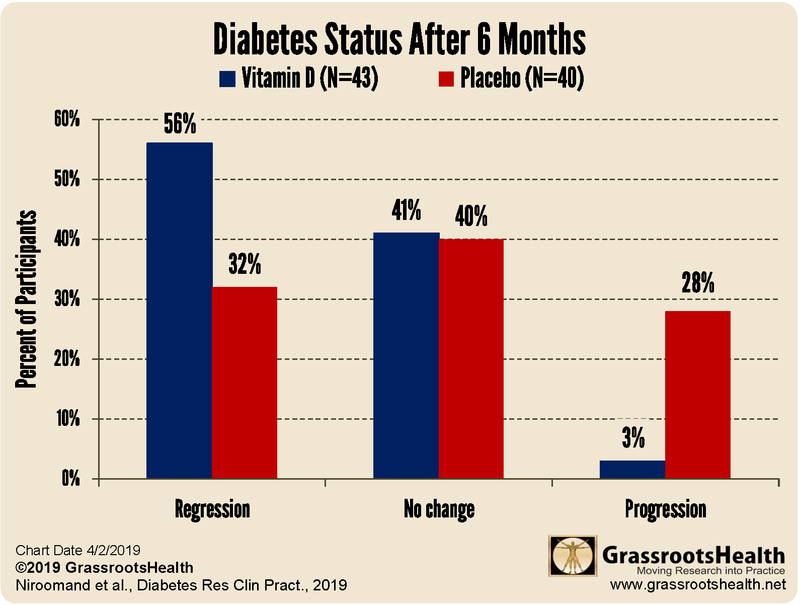 Also, the chart below shows that the rate of diabetes progression was significantly lower among those in the vitamin D group compared to those in the placebo group (3% vs. 28%, P=0.002). 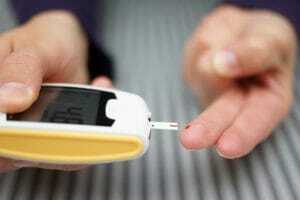 How can I find out if I’m at risk for diabetes? GrassrootsHealth offers a Hemoglobin A1c dried blood spot test, which provides information about the average blood glucose levels over the prior few months. Generally levels below 5.7% are considered normal, 5.7% to 6.4% are considered prediabetic, and levels of 6.5% or higher are considered diabetic. This test can be used by a healthcare professional, along with other tests and a physical exam, to help diagnose type 2 diabetes and prediabetes and for diabetes management. Knowing your Hemoglobin A1c levels can enable you to focus your health efforts on lifestyle changes, such as diet, exercise, and improving vitamin D and omega-3 status, which can help prevent or even reverse prediabetes. Be sure to consult your physician if you think you are at risk for diabetes and for specific recommendations for your health. The Inflammation Panel test kit from GrassrootsHealth provides blood spot tests for vitamin D, omega-3, and HbA1c, as well as hsCRP (an inflammatory marker). Order your kit today with coupon code ProtectWithD for 10% off! How can I track my Vitamin D and Hemoglobin A1c levels? To help you track your Vitamin D and Hemoglobin A1c levels, GrassrootsHealth has created an online tracking system called myData-myAnswers. You can also track your omega-3 levels as well as your diet, weight and exercise to see how they impact your Hemoglobin A1c levels. Check it out now!